Union Del Barrio: Trumpism Is An Imminent Threat! ¡La Amenaza Trumpista Es Real! 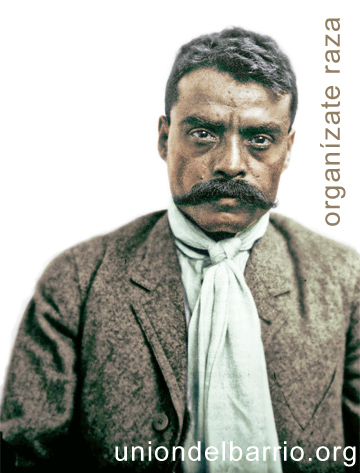 We must be organized raza! In a speech Donald Trump delivered on August 31, 2016, in Phoenix, Arizona, he increased the intensity of his anti-Mexican rhetoric to a level we have not seen within a presidential campaign, in at least a lifetime. Win or lose, his candidacy “a soltado los demonios,” and “trumpism” has become an imminent threat to the security and well-being of our communities, our families, and our future. The Democrats will not defend our communities from “la amenaza trumpista.” If anything, Obama has proven that mass raids and deportations are a central part of the Democratic Party strategy for “Latino outreach.” By the time he leaves office, he will have deported at least 3 million people. Hillary Clinton is no better. She is currently moving her campaign more towards the right wing, actively seeking to attract “moderate Republicans” into the Democratic Party. The Democratic Party is not our friend. Enrique Peña Nieto is the president of a murderous and corrupt narco-government. Today, as he shook Mr. Trump’s hand, he showed the world what a shameful, useless, lapdog he truly is. The Mexican government is not our friend. There are 50 million of us living within the current borders of the United States. WE ARE NOT A MINORITY. When we unite, we will defend ourselves, we will shake the political foundations of this county to reshape the power structure, and never again will animals like Donald Trump threaten us, in order to advance their own political careers. Raza – we must be our own liberators! 1 Response to Union Del Barrio: Trumpism Is An Imminent Threat! ¡La Amenaza Trumpista Es Real!